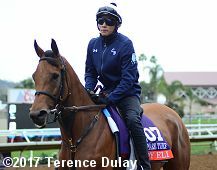 Mind Your Biscuits watches fellow sprint hrose Practical Joke walk by just before his workout. 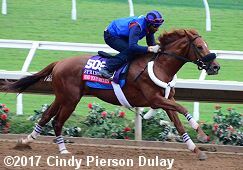 Monday morning was overcast with low handing clouds for the morning works at Del Mar, with temperatures in the mid 60's and with some very light precipitation. We got to the track just after 7am today. The post position draw will be this afternoon, so check out all the entries, post positions, and morning line odds here later today. 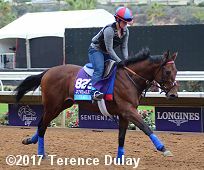 There weren't as many horses out as a typical Monday before Breeders' Cup with many still at Santa Anita, such as trainer Aidan O'Brien's string that arrives at 9:30PM, and Bob Baffert's large group who will arrive on Tuesday morning. 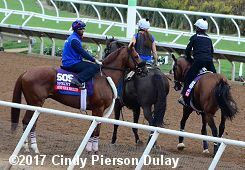 Here are photos for 35 of the horses on the track Monday morning. Click the small picture to see a larger version. Win The Space worked half a mile in 49 3/5 under jockey Joe Talamo. 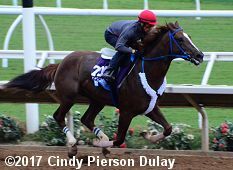 Trainer George Papaprodromou said, "He did his last workout today and he went a good half mile and galloped out strong. He will walk tomorrow and we'll go from there." Talamo, who will ride the 30-1 Classic outsider from post 3, added, "He went real nice." Bahamian drew post 8 as a 30-1 outsider in the Juvenile for trainer Simon Callaghan. 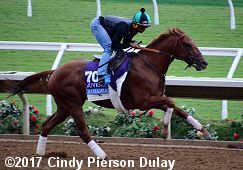 Still a maiden after 3 starts, he was 9th in the Champagne (G1) at Belmont for his final prep. 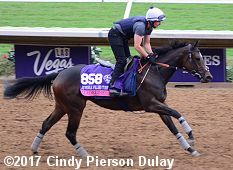 Ballagh Rocks worked 4f on turf in 49 3/5 before drawing post 11 as a 12-1 shot in the Mile. 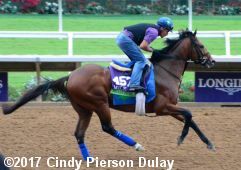 Trainer Bill Mott said, "It was a good strong work. He went well and he's training well." Bar of Gold was out this morning before drawing post 5 as a 30-1 longshot in the Filly and Mare Sprint. Jockey Jose Ortiz gets the call to ride her on Saturday. Beach Patrol drew post 12 at 6-1 morning line in the Turf for trainer Chad Brown. 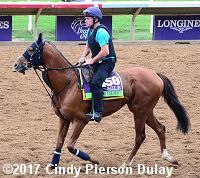 He comes here off a 2 race win streak, the Arlington Million (G1) and the Joe Hirsch Turf Classic (G1). Bullards Alley is 15-1 morning line out of post 2 in the Turf. New jockey Javier Castellano gets the call for trainer Tim Glyshaw. 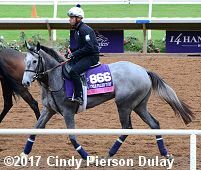 After finishing 6th in the Kentucky Turf Cup (G3) he upset Woodbine's Pattison Canadian International (G1) at odds of 43-1. Calculator worked 5f in 59 4/5. Trainer Peter Miller said of his Sprint entrant, "He went super, really good. I was looking for a minute or 1:01 but he went really well and did it easy." The 20-1 outsider drew the rail. Cambodia drew post 6 at 8-1 morning line in the Filly and Mare Turf for trainer Tom Proctor. 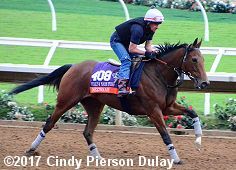 She comes here off a 2 race win streak, both at Del Mar: the Yellow Ribbon (G2) and the John C. Mabee (G2). Carina Mia drew the rail in the Filly and Mare Sprint. The Chad Brown trainee is 12-1 morning line. She comes here off a close second in the Gallant Bloom Handicap (G2) at Belmont Park. 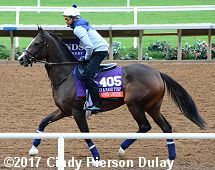 Elate worked 4f in 49 seconds on Sunday. 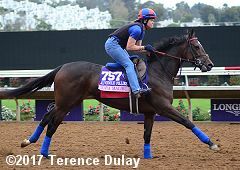 Trainer Bill Mott said "She went very well and looks good today. She jogged a mile today and looked good. She's a straightforward filly." The 3-1 second choice in the Distaff drew post 5 in Friday's finale. 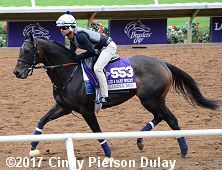 Giant Expectations drew post 2 in the Dirt Mile on Friday. The Peter Eurton trainee is 12-1 morning line off a disappointing 5th place finish in the Santa Anita Sprint (G1) after winning the Pat O'Brien (G2). Golden Dragon is a 30-1 outsider in the Juvenile. He drew post 10 for trainer Mikhail Yanakov. 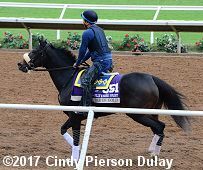 He broke his maiden in his 3rd try then won an allowance for his final prep, making his stakes debut in the Championships. Good Magic drew post 6 in the Juvenile for trainer Chad Brown at 8-1 morning line odds. He finished 2nd in both of his starts so far, his debut at Saratoga and the Champagne (G1) at Belmont. Grand Jete is a 6-1 contender in the Filly and Mare Turf. The Chad Brown trainee drew post 6. After winning her first 3 starts in the U.S. she was second in the Beverly D (G1) and third in the Flower Bowl (G1). Heart to Heart gelloped under exercise rider Arnoldo Orellano. Trainer Brian Lynch said of his Mile entrant, "I don't think I'm going to work him here. He smells a racetrack and he's ready." Julien Leparoux gets the call on the 6-1 contender out of post 2. 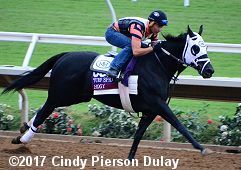 Hogy goes in the Turf Sprint on Saturday for trainer Mike Maker. He drew the 10 post at odds of 12-1. 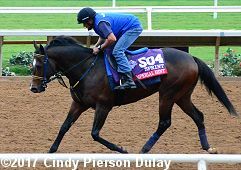 This will be his 47th career start, after winning the Kentucky Downs Turf Sprint (G3) and then a close second in the Woodford (G2) at Keeneland. Hollywood Star will break from the outside 12 hole in the Juvenile. The Dale Romans trainee is 15-1 morning line. After winning his debut he finished 2nd in both the Saratoga Special (G2) and the Iroquois (G3). 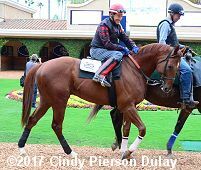 Home of the Brave arrived Saturday and cleared quarantine Monday. The Mile entrant walked 1 lap and then jogged 1 lap of the main track. Imperial Hint will break from the outside 10 post in the Sprint. 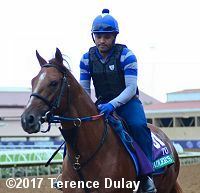 The Luis Carvajal Jr. trainee is 9-2 third choice on the morning line off a 6 race win streak, incluing the Smile Sprint (G3) at Gulfstream and the Donald LeVine Memorial at Parx for his final prep. Madeline arrived Saturday and cleared quarantine Monday. 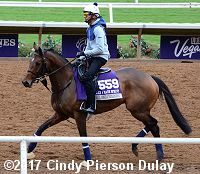 The Juvenile Fillies Turf entrant walked 1 lap and then jogged 1 lap of the main track. She comes here off a 3rd place finish in the Cheveley Park Stakes (G1) at Newmarket. 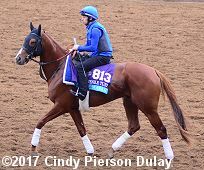 Masar arrived Saturday and cleared quarantine Monday. The Juvenile Turf entrant walked 1 lap and then jogged 1 lap of the main track. Trainer Charlie Appleby said, "He has similar credentials to (2013 winner) Outstrip. He finished third in the Prix Jean-Luc Lagardere in bottomless ground but he should be at home on this faster surface. When I first started at Godolphin it was my ambition just to have international runners but it has slightly changed now because I want to have international runners with live chances." Maya Malibu drew post 10 in the Juvenile Fillies. The Graham Motion trainee is 20-1 morning line. After winning her debut she was 2nd in the Spinaway (G1) and 3rd in the Frizette (G1). 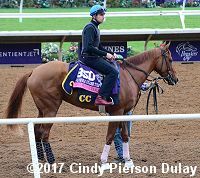 Mind Your Biscuits worked 3f in a bullet 36 2/5 in preparation for the Sprint. Trainer Chad Summers said, "I got him out in 48 1/5, and 12-and-change into the pole, and then 23-and-change. It was all I was looking for. It was a good finish; I wanted a blowout and we're happy with it. He's a horse that likes getting in early and getting used to new surroundings. 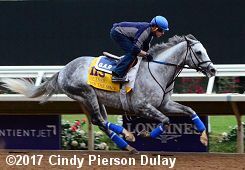 We paddock schooled him Saturday and will again on Wednesday." He drew post 6 at 6-1 morning line. 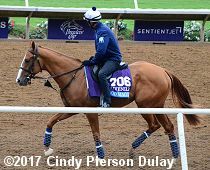 Mongolian Saturday, 2015 winner of the Turf Sprint will try for a second Cup win, drawing post 9 at morning line odds of 20-1. Winless since that victory at Keeneland, he comes here off a 3rd place finish in the Woodford (G2). Mopotism is the longest shot on the board at 30-1 in the Distaff. The Doug O'Neill trainee drew post 3. She was 4th in the Cotillion (G1) at Parx last out. Mr. Roary worked 4f in 49 1/5 this morning before drawing post 3 as a 30-1 longshot in the Mile. Trainer George Papaprodromou said, "He went good. 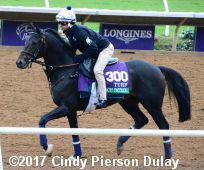 (Jockey) Tyler (Conner) said he seemed to like the course and he changed leads at the right place." 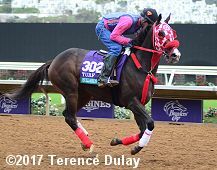 Nezwaah shipped in last Wednesday and galloped on the main track Monday under exercise rider Wayne Tanner, who said "We will breeze her tomorrow with blinkers on just to sharpen her up. She won't run in them but it may just get her to concentrate." The 20-1 outsider in the Filly and Mare Turf drew post 11 for trainer Roger Varian. Oscar Performance went out for a jog a day after he worked 4f on turf in 47 seconds. Trainer Brian Lynch said of his Turf entrant, "I love his energy level. He worked yesterday about as comfortable as a horse can work. We will let him break and he�ll be up there. 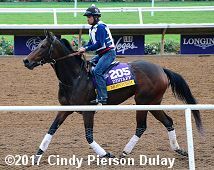 I�m not saying we are going to make the lead, but we will definitely let him run away from there and get comfortable and find his stride. 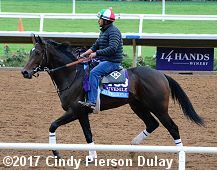 I thought he had a lovely work over the track and also gave him a little stamina work at Keeneland before we left." Jose Ortiz gets the call aboard the 10-1 contender from post 14. Paulassilverlining will break from the 2 hole in the Filly and Mare Sprint. The Chad Brown trainee is 8-1 morning line. After winning her first 3 starts of the year she was 5th in the Ballerina (G1) at Saratoga. Sadler's Joy drew post 13 in the Turf for trainer Tom Albertrani. He is 12-1 morning line. After winning the Sword Dancer (G1) he was 4th in the Joe Hirsch Turf Classic (G1). Significant Form is 8-1 on the Juvenile Fillies Turf morning line, and drew post 8. She is undefeated in 2 starts, her debut at Saratoga and the Miss Grillo (G3) at Belmont. 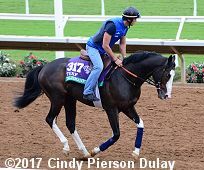 Talismanic arrived Saturday and cleared quarantine Monday. 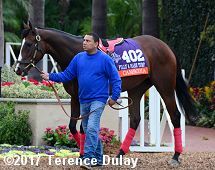 The Turf entrant schooled in the paddock and then jogged once around the main track. Untamed Domain drew post 2 in the Juvenile Turf. The Graham Motion trainee is 8-1 on the morning line, off his win in the Summer Stakes (G2) at Woodbine. 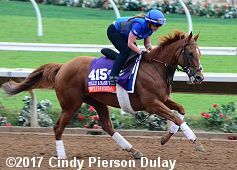 Wuheida shipped in last Wednesday and cantered twice around the main track Monday under exercise rider Kirsty Milczarek. The 20-1 outside in the Filly and Mare Turf drew post 5 for trainer Charlie Appleby. 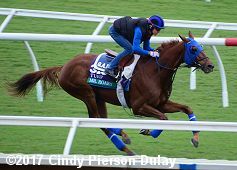 Appleby said, "She got a corn when she was at Keeneland and unfortunately had to miss the Queen Elizabeth II, but the team has done a great job with her. She has rock-solid form since the summer and I can't give her a negative at this moment. 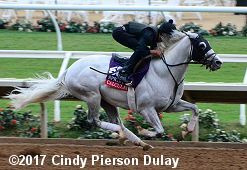 She has plenty of pace and the trip here at Del Mar is absolutely no concern."